After you have downloaded and installed Zend Server, you will be automatically using a Zend Server Enterprise edition trial license. This license gives you full access to all Zend Server features for a period of 30 days. Once this trial period ends, you will have to purchase a commercial Zend Server license to continue using the product. License details can be updated at any stage during a subscription period, or during a trial period on the License page. For more information, see Registering a Zend Server License below. This procedure describes how to register a commercial edition of Zend Server. This procedure can only be performed by user 'admin'. In the UI, go to Administration | License. Below the current license details, click . 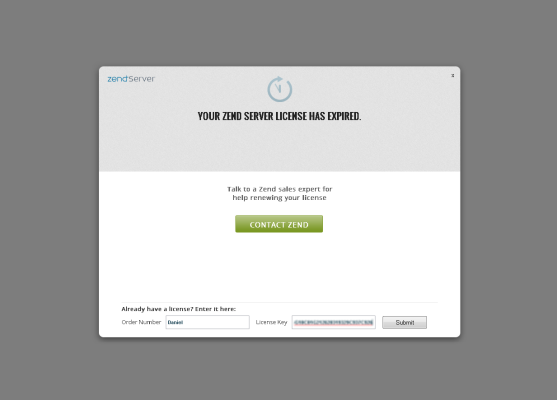 The Change Zend Server License dialog is displayed. Order Number: Name or number of Zend Server license. License Key: Zend Server license key. 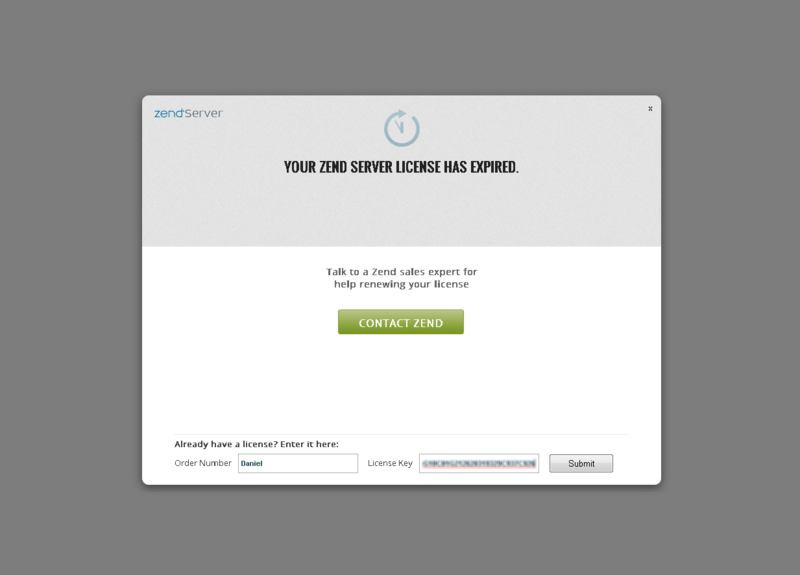 Zend Server will validate the license, and a verification message is displayed. In case of a Developer edition, you will be required to confirm using Zend Server for development purposes only, and not for production. Zend Server performs a Full Restart, during which the UI is not accessible. A success message is displayed, informing you that the new license was successfully saved. The success message varies according to the current license you are using, and the license details entered in the Change Zend Server License dialog. Click Continue using Zend Server to return to the UI and continue working with Zend Server. You will notice that the License page now displays the new license details. Before your Zend Server license expires, the Notification Center will notify you of the coming expiration date. Click to be taken to the License page, and follow the instruction above to register new license details. Once the license expires, you will not be able to log in to Zend Server with the expired license details, and any attempt to do so will display the License Expiration page. The Expiration page displays differently according on the type of license that expired. 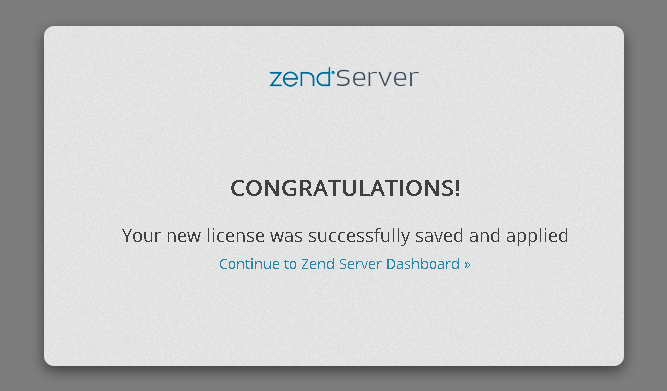 If you have not yet done so, click Contact Zend to renew or purchase a Zend Server license. Order Number: Name or number of your Zend Server license. License Key: Your Zend Server license key. Once entered, Zend Server will verify the license details. Zend Server is restarted and a success message is displayed. Click Continue to Zend Server Dashboard. The Zend Server Overview | Dashboard page is displayed.